I just uploaded a new mobile-capable lecture, called “Telling a Story with Pictures: Modes of Early Chinese Narrative Illustration.” This is one of my favorite lectures of all time, though I have only given it on a few occasions. It is based on research conducted while I was a PhD student in Art History at Princeton. It explores different modes of illustrated narrative in Greece, Rome, and India as a way to understand the development of narrative illustration in Han and Six Dynasties China. Several entertaining early Chinese stories are introduced, including the “Shun Cycle,” and the tales of filial sons like Lao Laizi, Yuan Gu, and Dong Yong. The PowerPoint slides are annotated with dynamic markers like arrows and spotlights to highlight aspects of the illustrations. Click here to go to the lectures page. New lectures uploaded, now mobile capable. I have just uploaded two lectures to my website. The first is called “Artisans of Ancient China,” and is a summary of the research that went into my award winning book, Artisans in Early Imperial China. It was recorded from a talk given at the Santa Barbara Museum of Art in 2009. The lecture will run on computers or mobile devices. The second lecture is called “Burning the Books and Killing the Scholars” and was delivered at UCLA in 2008 as part of an endowed lecture series. The three videos, hosted on the UCLA website, contain excerpts from the lecture, along with an interview I did with Chinese literature scholar David Schaberg. Click here to go to the lecture page. My son Jordan and I are working on a project I have been meaning to get to for a long time. I have well over one thousand books in my faculty offices. Most of these are about China or Egypt, and they are in a variety of languages. It has become harder each year to remember where each of them is located in my offices. Also, I tend to loan books to students for project on a regular basis, and I loose track of who has my books. So, Jordan and I are entering all of my books into a computer book database called Readerware (www.readerware.com). We then print Library of Congress spine labels for each book, and stamp the inside with a custom stamp that reads “Scribe of History” (left) in a combination of Ancient Egyptian Hieroglyphs and Chinese characters. Now, I will be able to look up my books from anywhere, since the program also has a mobile app, and I can record which ones I have loaned out to students. 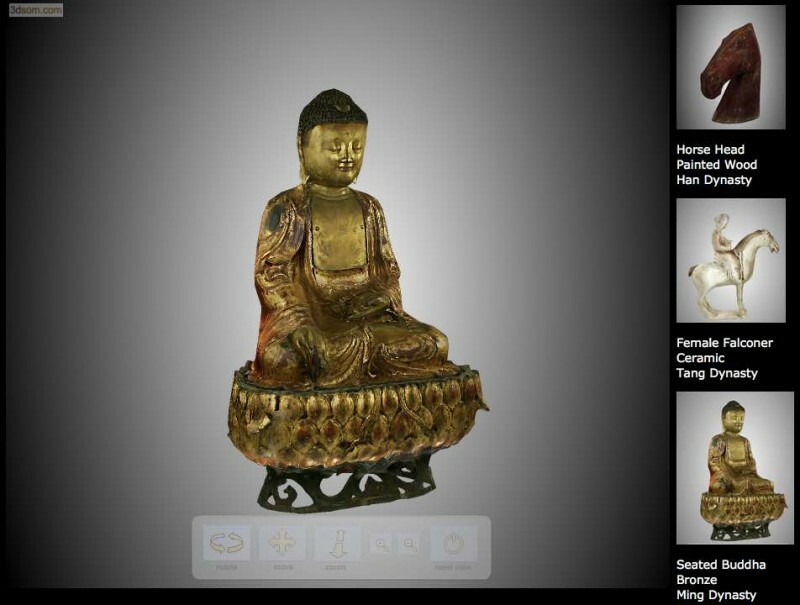 As a residential scholar at the Getty Research Institute in 2011, I created this virtual museum videogame called “Artifacts of the Ancient World in 3D.” It includes objects from Ancient China, Greece, Iran, and Mesopotamia housed in the Santa Barbara Museum of Art, as well as some objects from Chinese museums. Click here to go to the description page, and play the demo today! On Friday October 16, 2015, I spent half a day at the Metropolitan Museum of Art in New York studying the representations of scribes in Egyptian art, and the tools that the scribes used to practice their craft. I was guided by Assistant Curator of Egyptian Art, Niv Allon, who is also very interested in scribes in the New Kingdom and their culture. Of special interest to me were the practice boards used by scribes for school texts, one of which contains corrections from a teacher and another text underneath the visible one which had been whitewashed over. I was also studying the scribal palettes which held the ink and reed brushes of scribes. These usually had two depressions, one for red and one for black ink, but those used by painters might have six or eight depressions for different pigments (see left). These palettes were also found in the tombs of non-scribes, who sometimes had them made out of stone or other materials (below right) as a non-working representation of a scribe’s palette, thus a marker of cultural literacy and its attendant power. A very famous object on display was the scribal statue of Horemheb, from before he became Pharaoh. It probably dates to the reign of Tutankhamen. Horemheb is seated as a scribe reading (or writing on) a papyrus, a pose which goes back to the Old Kingdom. Back in 2008 I created these 3D models from standout objects of Chinese art in the Santa Barbara Museum of Art. These include a Han Dynasty ceramic horse, a large bronze Buddha, and a Tang figurine of a woman falconer. Click here to view the full description page and gallery. Professor Barbieri-Low has recorded some of his best classroom and public lectures and posted them to this site for anyone to enjoy. These include lectures on the tomb of the First Emperor of Qin, with his famous terra-cotta warriors, a lecture on the tombs at Mawangdui, and another on the use of material culture and inscriptions to rewrite early Chinese history. Enjoy! Between 2002 and 2005 Professor Barbieri-Low created a computer-based reconstruction of the famous Wu Liang Shrine, and the other tombs and shrines in the Wu Family Cemetery in Jiaxiang County, Shandong, that date to the Eastern Han Dynasty. Click on the link below for details of this project, still images and videos of the reconstruction, and the interactive QuickTime based virtual reality tour of the site. Click here to go to reconstruction! While teaching World History (History 2A) during the last few years, I have been experimenting with various historical games or simulations that might make the study of the ancient world more memorable. Some of these ideas were originated by my TA’s during our History 500 (TA workshop) sessions, and others I brainstormed over of last couple years by myself or with my students. While teaching History 2A this summer, I decided to try a whole series of these experiments in conjunction with a “flipped classroom,” in which I placed half of my traditional lectures online as podcasts, freeing up additional classroom time for discussion and experiment. In our first exercise this summer, I wanted to test Karl Wittfogel’s theory that the need to organize labor to build and maintain large-scale irrigation works would lead to hierarchical power structures (i.e. “despotic leadership”), as seen in the early states of Mesopotamia, Egypt, and China. I brought the class down to Campus Point beach and divided them into two teams. 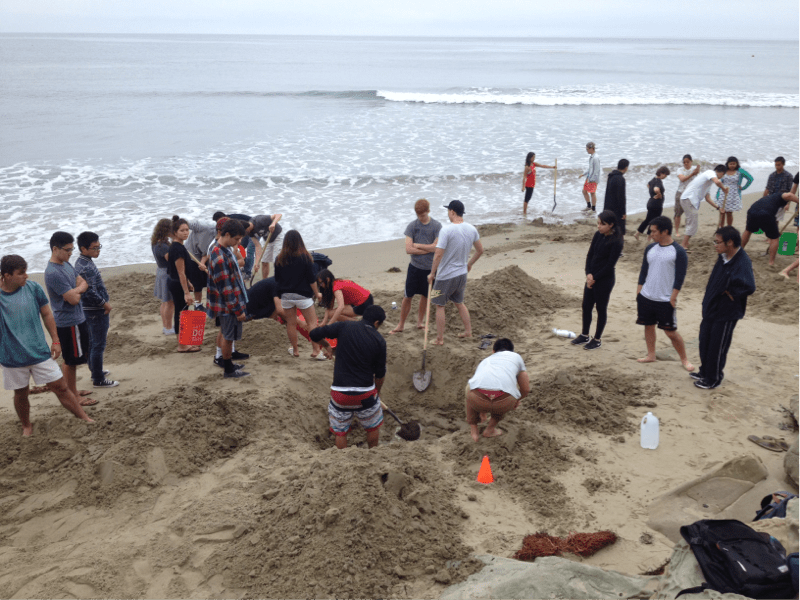 Each team of 30 students was given only five buckets and five shovels, and told to dig a pit either 6, 9, or 12 feet in diameter, fifteen feet from the water. Whichever team moved the most water from the ocean to their storage tank in one hour, would be the “winner.” I gave them no guidelines on how they were to achieve this or how they were to organize themselves. The teams quickly organized and leaders did emerge to take control. While some teams experimented with more collaborative or “democratic” labor organization schemes, eventually one or two outspoken males began to dominate and tell the group what needed to be done. The groups also conducted espionage on each other to see if they could obtain intelligence about better methods. After failed attempts to dig a canal from the ocean to their storage tanks, both groups settled on a bucket brigade to move the water most efficiently. The 9ft diameter pool of the winning team went to a depth of 19 inches, which totaled 753 gallons of seawater, weighing 6475 lbs. (!). Another exercise sought a way to bring the material culture of the ancient world into the student’s hands and to make it real. I decided to focus on writing and writing materials in ancient China and Egypt. In one activity, the students worked to make their own sheet of papyrus, pressing together individual strips with a clamp, while they also practiced writing a particular phrase (a ritual offering) in the calligraphic Egyptian script called hieratic. 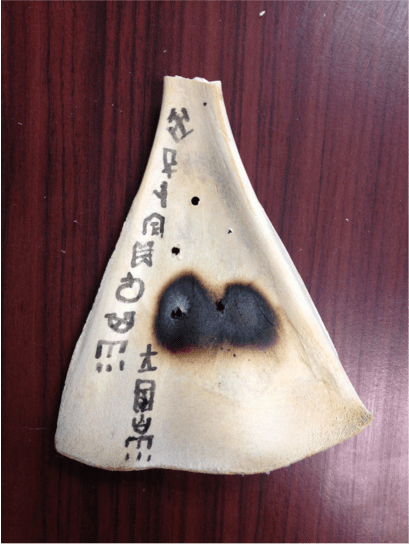 The other activity asked the students to prepare a cattle scapula for a divination about rain, an important ritual performed by the kings of bronze age China around 1200 BCE. Working in pairs, the students sawed, sanded, and drilled the bone to prepare it for the divination charge. They also practiced writing in oracle-bone script, the earliest known form of Chinese, so that they could later inscribe their bone with the divination record. Once the bone was prepared, we heated the bone with a flame and cracks appeared on the surface and a loud sound was heard. The students interpreted this as a positive divination response that it would rain in the next ten days. Some students later reported to me that their bikes were wet when they found them the next morning, and attributed this minor rain event to our divination, which I had informed them was not just a question of the gods and ancestors, but also a charge to make a favorable event actually come about. Some of the other activities we experimented with this summer included composing impromptu epic poetry about the victory or defeat in the beach exercise, to understand how Greek bards composed poems like the Iliad and the Odyssey; holding a mock trial in a Babylonian law court to better understand how Hammurabi’s Code functioned and its legal principles; and conducting a Chinese court debate between Daoist, Legalist, and Confucian advisors on how to solve the problems of the empire. Though I had tried some of these exercises individually before, orchestrating all within the same term really made the course material come alive for some students, who reported to me that this was the most memorable class of their entire time here at UCSB, and nothing like any history class they had ever taken. I can say that it was one of the most exciting and rewarding experiences I have had as a history teacher as well. Conducting such experiments is labor intensive and time consuming, but the reward for the teacher and for the engaged student is truly worth it.